Howe Sound Brewing brewed a new pale ale in collaboration with the brand new Sea To Sky Gondola project both located in Squamish BC. 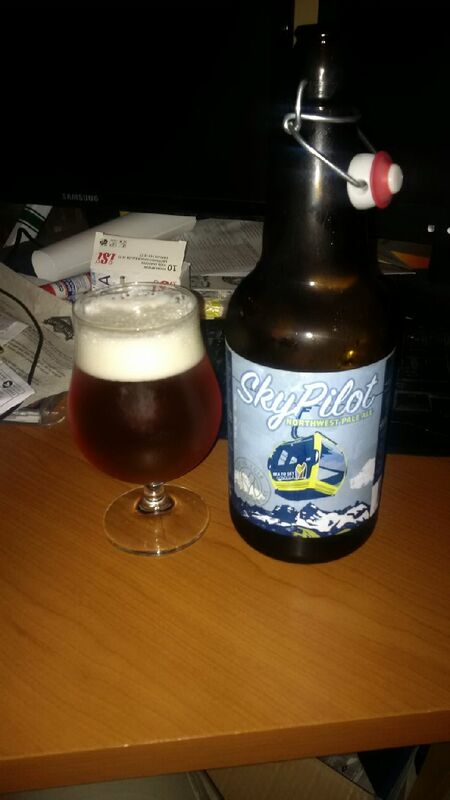 The beer is the “Sky Pilot Northwest Pale Ale” and is named after Sky Pilot Massif a prominent peak on the Squamish skyline seen from the Sky Pilot Suspension bridge. The beer pours an orange/gold colour with a white head. The aroma consists floral hops, citrus and caramel malts. The flavour is of hops bitterness, pine, citrus, caramel malts with a mildly earthy finish. The alcohol content comes in at 5% with an IBU of 30. This is a very solid Northwest Pale Ale and can be enjoyed either in bottles or on tap at the Sea To Sky Gondola on the patio or inside the cafe. Commercial Description: Brewed in collaboration with the Sea to Sky Gondola opening, May 16, 2014, this refreshing, golden pale ale with an assertive hop aroma. Brewed with Canadian two row malt, specialty malts and a blend of Cascade, Centennial and Summit hops, premium Squamish water and American Ale yeast. A delicious modern classic. Enjoy the experience! Food pairing as per brewery: The noticeable hop profile in this ale allows it to stand up to spicier foods such as curry and tacos. This entry was posted in Pale Ale and tagged bc, bitter, bitterness, canada, caramel, caramel malt, caramel malts, citrus, citrusy, earth, earthy, hopped, hops bitterness., hopy, Howe Sound Brewing, mild earth, northwest pale ale, pale ale, pine, sea to sky gondola, sky pilot, sky pilot massif, sky pilot northwest pale ale, squamish. Please compare to their Best Bitter and Honey Pale Ale. totally different beers but that could be interesting.